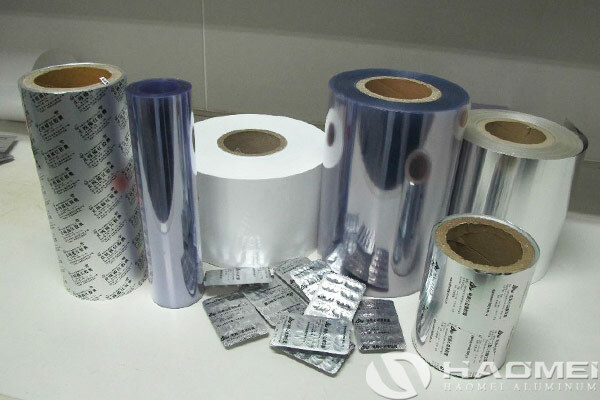 Medical aluminum foil supplier Haomei produce 8011-H18 and the 8021-O cold-formed foil as representative products of medicinal aluminum foil. The processing thickness range of 8011 and 8021 medical aluminum foil is 0.018-0.2mm, width range of 100-1650mm, can be customized according to different needs of customers. To the 8011-H18 medical grade aluminum foil is common used to adhere to the back side of the plastic packaging material. The 8011 H18 aluminum foil after compounding, printing and coating is widely used as a blister aluminum foil packaging material. Therefore, the surface is required to be clean, uniform in color, free from spots, and flat without pinholes. 8011 medicine aluminum foil has excellent moisture resistance, shading and high barrier ability, strong mechanical properties, high anti-blasting performance and strong puncture and tear resistance, non-toxic, tasteless, safe and hygienic. The 8021-O cold-formed aluminum foil is pressed and formed into a sealed package after deep drawing. Therefore, it has strong mechanical properties, high blast resistance, strong puncture and tear resistance. Besides, medical aluminum foil supplier can ensure excellent moisture resistance, shading and high barrier ability; clean surface, uniform color, no spots, no oil, no pinhole.